By the time veterans of two primitive coal railroads started holding annual picnic reunions in Scranton in 1904, the era of "gravity railroading" had been closed for the better part of a quarter-century. The retirees were dying off, and with them the first-hand accounts of how industrial railroading had been done without locomotives, or animals, for propulsion. Like the Switchback Railroad at Mauch Chunk, the Pennsylvania Gravity Railroad and the Delaware and Hudson's gravity railroad used steam or water power to pull empty cars uphill, and gravity to roll loaded coal cars downhill. All three companies quickly discovered that they could make extra money by hauling passengers, and they built cars for that purpose. By the 1880s, however, this ingenious system was replaced with conventional locomotives pulling cars. The Gravity Employees' Association, an organization of veterans of the Pennsylvania Coal Company (PCC) and Delaware and Hudson gravity railroads, held its first annual gathering at Scranton in 1904. They swapped tales of the days, when, as strong young men, they relied solely on their wits, ingenuity, and pluck to carry out the most basic of railroad operations. Each year, fewer and fewer of the aging veterans returned to the reunion, and those who remained became increasingly aware that their stories were fading with their own passing. Before practical steam locomotives were developed in the 1830s, transportation companies relied on an interconnected series of inclined planes to surmount hills and lightly sloped "levels" (where cars could drift by gravity or be pulled by horses) for more gentle terrain. Loaded cars were lifted up the grades by one of three methods: by the counterweight of cars going downgrade; by a stationary steam-powered winch; or by a winch powered by a water wheel. By 1850, the PCC's forty-seven-mile gravity railroad extended from Pittston on the Susquehanna River to Hawley on the Delaware and Hudson Canal. 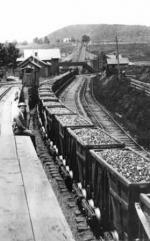 At Hawley, workers transferred the coal to the D and H Canal for shipment to the New York market. Later, PCC built a sixteen-mile branch from Hawley to Lackawaxen. Gravity railroad cars were open, flat boxes that typically carried more than a ton of coal. Cars loaded with anthracite on the PCC gravity line reached speeds exceeding fifteen miles per hour on the steepest inclines. In the mid-1800s, riders in open passenger cars sat on plank benches, delighted at these early roller coasters. Other coaches, like one built by PCC about 1850 and named "Pioneer," consisted of a closed body with roofs and windows, and closely resembled conventional, all-weather railroad coaches. 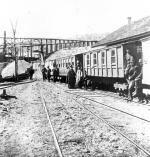 Unlike some other gravity operations, the Pennsylvania gravity railroad and the D and H's own sixteen-mile gravity railroad from Carbondale to Honesdale maintained separate tracks for descending and ascending cars. The company used a "loaded track" to bring full coal cars down to Hawley and a "light track" that carried empty cars back to Pittston. In places, the two PCC tracks were miles apart. In 1885, the gravity railroad was abandoned and rebuilt as a conventional railroad, the Erie and Wyoming Valley, which eventually was merged into the Erie Railroad. In the early 1900s, gravity railroad veterans decided to restore the PCC's surviving "Pioneer" passenger car to serve as an icon of the early days of the anthracite coal region and the role that early railroads had played in the settlement and economic development of the region. The "Pioneer" would also memorialize their all-but-vanished way of life and livelihood. Members of the group refurbished the "Pioneer" and presented it to the city of Scranton at their reunion in Nay Aug Park on September 4, 1909.